Two IIM Ahmedabad students, Arpita Kar and Tanya Choudhury, have different dreams and see themselves at different places in the future. Business Today'sT.V. Mahalingam profiles the two who are like chalk and cheese. Tanya, 23, on the other hand, is a Mohammad Rafi, Abba and Beatles fan. The B.A. English (Honours) graduate from Jadavpur University is a lot more laid back, and lot more dreamy eyed than her younger batchmate. “I’m missing the comforts of a familiar place, missing the people I used to know,” says Tanya who is staying away from home for the first time in her life. “Back home (Kolkata), I knew where to go, to buy what and what price to pay. Both of them are polyglots. Arpita can speak English, Hindi, Bengali and French. “I learnt French largely because it looked good on my CV,” jokes Arpita. Tanya, on the other hand, can speak English, Bengali, Hindi and a smattering of Arabic—thanks to her upbringing in Saudi Arabia. 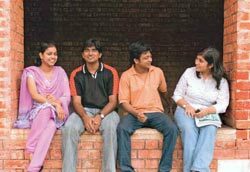 Both Tanya and Arpita concede that despite being rated very high in their respective academic careers, the quality of talent at the institute makes them feel “inadequate”. “One feels inadequate because there is always somebody better,” says Tanya, who worked for a brief while as a copywriter in a small agency in Kolkata. Arpita joined the course right after passing out from Lady Shriram College, Delhi. “I’m a fresher with no work experience to talk about. In that sense, I have a little to contribute and a lot to gain,” says she. So, what do they expect to do in future, other than earn a fat sixdigit pay packet at the end of two years of slumming? For Arpita, it’s again a question of progression. “I’ve always loved playing with money,” she laughs. “So I guess, it will have to be a job in finance.” As for Tanya, her own small outfit to help the less privileged would be a possible dream job. If that doesn’t happen, she’ll settle for a job in media and communications. “I hope I have the ability to get over the lure of what I’m likely to earn once I pass out of here,” says Tanya.